Compared to bulk materials, atomically thin materials like transition metal dichalcogenides (TMDs) offer size and tunability advantages over traditional materials in developing miniature electronic and optical devices. The 2-dimensional TMDs are of particular interest because they have potential applications in energy conversion, electronics and quantum computing. The properties of these materials can be tuned by external forces like applying tensile strain or electric fields, but until recently, nobody had identified a means of intrinsically tuning these materials for optimum photoluminescent or optoelectronic properties. To tune the material without needing external forces, researchers at Los Alamos and their external collaborators instead sought to control the ratios of isotopes within TMDs. This type of delicate manipulation is recently made easier using Rutherford backscattering spectrometry thanks to improvements to the Ion Beam Materials Laboratory's tandem accelerator, which was upgraded last year for more precise energy tuning, better beam stability control and improved reliability in overall operations. The new capabilities allowed the team to take precise measurements of the atomic ratios in their samples and characterize the high-quality materials that were essential to testing the effect of isotopic concentration on material behavior. Because different isotopes of an element have the same number of charged particles (electrons and protons), isotopic variations in atomic mass are due to uncharged particles (neutrons) and therefore are not expected to have an effect on electronic band structure or optical emission. In fact, this assumption is so common that theorists do not usually consider isotopic composition when modeling these properties. In this work presented in Nano Letters, the team found that isotopic composition had a surprising blue-shift effect on the light emission spectra. To investigate this, they performed additional studies and proposed a model for the effect. They propose that the effect of isotopic purification on atomic mass leads to a decrease in phonon energies and ultimately a difference in electronic band gap renormalization energy, causing the optical shift. For future experiments, the group plans to further use IBML resources. Besides high precision analysis and implantation capability on the upgraded tandem accelerator, IBML also hosts two low energy ion implanters that can chemically dope and/or introduce "desired" defects into the isotopically pure sample. They hypothesize that creating isotopic defects in the structure will have pronounced effects on the optical and thermal properties of the material. The work was funded by a National Science Foundation CAREER Award granted to Pettes. Precision thin film characterization was enabled by the Ion Beam Materials Laboratory, operated as a part of Materials Science in Radiation and Dynamics Extremes group in the Materials Science and Technology Division. 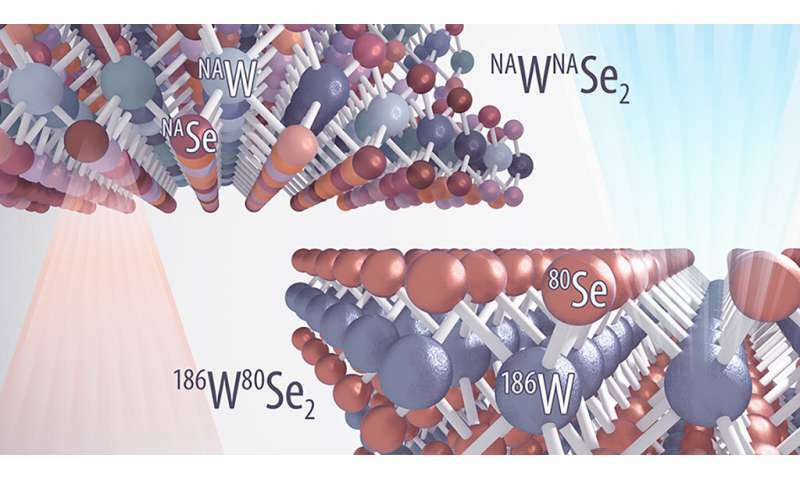 The IBML is classified as a DOE user resource through the Center for Integrated Nanotechnologies (CINT), a DOE nanoscience research center jointly operated by Los Alamos and Sandia national laboratories. Upgrades to the tandem accelerator were funded by the Principal Associate Directorate for Science, Technology and Engineering capital investment fund and the CINT capability development fund. The work supports the Laboratory's Energy Security and fundamental science mission areas and its Materials for the Future science pillar by identifying the materials properties that enhance performance in energy conversion and allow for the development of novel devices.